Students who consistently meet the standards will enjoy greater autonomy within the Sixth Form and are awarded Commendations. Those who fail to meet the Standards will be given Concern Notes. 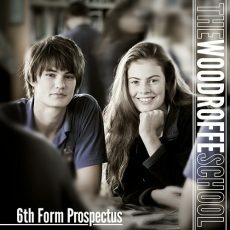 More information is available in the Sixth Form Prospectus. Shoes: Black, brown or navy (no trainers, nothing above ankle boots, heels or canvas shoes). Polo Shirt: Blue school polo shirt embroidered with the school crest. Jumper: The dark blue school hoodie with badge OR dark blue or black jumper. It must be plain – no edgings, logos or adornments. Jewellery: One ring, one watch, one (tasteful) earring in each earlobe. Earrings should not be too long for Health and Safety reasons. Coat: Suitable outdoor coat (coats must not be worn in the building or in lessons). Trousers: Conventional dark grey or black trousers (no jeans or denim material trousers, or black cotton baggy ‘fashion’ trousers). Skirt: Navy or black skirt (short mini-skirts are not appropriate for a school environment and cannot not be worn). OR Trousers: Navy or black tailored trousers (no jeans or denim material trousers, no leggings or jeggings or black cotton baggy ‘fashion’ trousers, no ¾ length trousers). Tights: Plain (not patterned) tights in blue, black, tan or grey. Scarves: Not be worn inside the building or in lessons. The Governors’ policy on hairstyles applies to the Sixth Form. Sixth Form students are permitted to wear one small earring per earlobe and one small and unobtrusive nose stud. In the event of a dispute regarding the latter, The Head of Sixth Form will be the arbitrator in terms of the interpretation of ‘small and unobtrusive’. The Headteacher will, if necessary, refuse entry to a student until such time as their uniform, hairstyle or appearance is deemed appropriate.